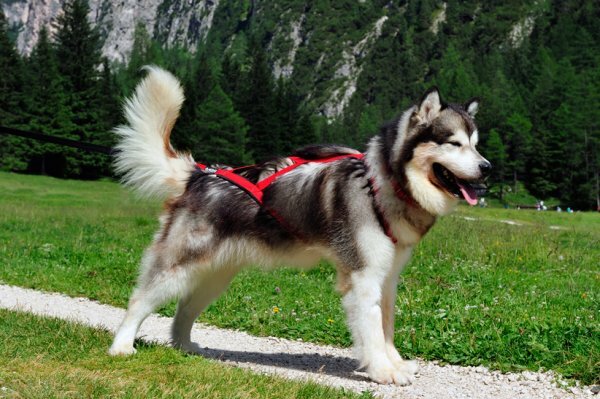 A Malamute companion for hiking - he or she will be your best furry friend! Mal Coat Identification:  click here. Mal Grooming & Care:  click here. Dog Friendly Hikes Near Denver:  click here. Intro to Weight Pulling:  click here. Upcoming Weight Pulling Events in Colorado:  click here. Pet food recall list – 2019:  click here. interested in fostering a malamute, please contact Sharon. Need Help Affording Vet Bills? Got an intact female? Locate a Spay clinic location in Colorado here. Polaris (or the North Star) Siberan Husky Rescue (PSHR) was founded in 1987 by Ingrid Simpson, when a very large husky named Kodi came to her house. Through the years PSHR has grown, helping more and more dogs find forever-families. Beginning in summer 2004, PSHR partnered with the national Alaskan Malamute Assistance League (AMAL) to provide adoption and rescue for Alaskan malamutes as well. Thus the Polaris Alaskan Malamute Rescue (PAMR) was born. PAMR provides education on, take in and adoption of malamutes. Our dogs come from a variety of locations around Colorado and bordering states, including shelters, strays, and private surrenders. Our motto is "We place dogs with families, not families with dogs." We place dogs of all ages, but there is a prevalence of one to three year malamutes that come into rescue. PAMR has a number of foster homes for care and placements, but we are always looking for volunteers to help. Alaskan Malamutes Are not the Breed for Everyone! If you are unfamiliar with malamutes, then you must do research on them first. A very good reference is provided by the Alaskan Malamute Rescue Of New England (AMRONE). Please read their Alaskan Malamute Education section thoroughly before considering adopting an Alaskan malamute. Also devote a moment now to read the information on this breed in the Malamute Facts page. See also the Suggested Reading before embarking on your Northern Breed adventure ... it will save you lots of heartache and headache in the end. Too often, Polaris is contacted by people needing to surrender their malamute because they just were not prepared to take on the responsibility of these challenging, albeit wonderful, breeds. PAMR wants to ensure that all of our potential adopters are well educated and informed regarding the true nature of the Alaskan malamute before welcoming a dog into their home. Watch an Animal Planet (Breed all about it) video here. When you are ready adopt one of our great dogs, take a look at our list of Adoptable Malamutes (please keep in mind that the malamutes listed here may not represent all of the dogs we have available; please call for the most current listing). Then simply fill out our adoption application. One of our volunteers will get back to you within a few days to begin the adoption process! Feel free to contact us about malamute adoptions, donations, and volunteering. Our volunteers would be happy to assist you with any of your Alaskan malamute related questions. We can provide you information on the breed in general,the Polaris malamutes that are currently up for adoption, or any other concern you may have about these great breed.